Although it's customary in many Western countries to wear a wedding ring on your left hand, other cultures differ in their traditions. In some places, brides and grooms wear wedding rings on the right hand instead. In addition, certain lifestyle factors and symbolic meanings may make it more appropriate to wear a wedding ring on the opposite hand. No matter what the reason, this is a tradition that is open to interpretation. According to Reader's Digest, the custom of wearing a wedding ring on the left ring finger is a fairly recent invention, even in English-speaking countries. 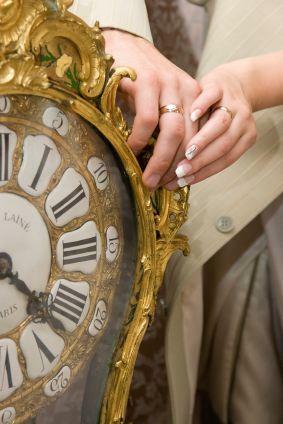 In fact, before the 1700s, people frequently wore their wedding rings on their right ring fingers. An 1869 article entitled The Wedding Ring postulates that this right-hand wearing may have been changed to the left, or generally non-dominant, hand as a way for women to show deference to men, who did not wear wedding rings at that time. Reader's Digest also asserts that the Romans wore wedding rings on their right hands. This may have been due to a cultural belief that the left hand was sinister or untrustworthy. Even today, when people make an important vow or take an oath, they place their left hand on a Bible and raise their right hand. This emphasis on the right hand as a symbol of honor may be related to the historical mistrust of the left hand. Hand choice is also a matter of culture. There are several countries in which brides and grooms still wear their rings on the right hand. German couples traditionally use a simple gold band as an engagement ring and place that band on the left finger before the wedding. After the wedding, they move the ring to the right ring finger, where they wear it as a symbol of their union. Master Russia reports that Russians also wear their wedding rings on the right ring finger. According to Latvian jeweler Sudraba Nams, brides and grooms in many Eastern European countries also follow this tradition. These include Latvia, Bulgaria, and Ukraine. According to Greek Wedding Traditions, Greek brides and grooms have worn right-hand wedding rings for many years. Those who are Orthodox Christians continue this custom. However, modern Greek couples living in Western cultures often wear their rings on the left hand. Matrimonial India asserts that modern Indian couples consider both the left and the right hand appropriate for wedding rings. Traditionally, the left hand was seen as unclean and unlucky, but that belief has changed in recent years. Today, the left hand is just as acceptable for wedding rings as the right in India. Alternative marriage traditions are not the only reason someone might choose to wear a wedding ring on his or her right hand. Wearing your wedding ring on your right ring finger might be best if one of these situations applies to you. For left-handed individuals, wearing a wedding ring on the left hand may get in the way of everyday tasks. Your left hand may also get banged around more, causing damage to your ring. In this case, wearing the ring on the right ring finger might prevent you from losing or harming your wedding ring. Health considerations can also make right hand ring wearing more practical for some people. For example, rheumatoid arthritis and other joint diseases may make cause swelling of the knuckles in one hand, making it difficult to put on or take off a ring. It only makes sense to avoid wearing your wedding ring on your left hand if doing so causes pain or other problems. If one member of the couple dies, it is common for the surviving person to wear the wedding ring on the right hand. This gesture symbolizes the continuing bond with the deceased spouse, despite the legal dissolution of the marriage by death. Ultimately, your choice of ring finger is a matter of cultural tradition and personal preference. Since wedding rings are only a symbol of your love, there is no legal requirement for wearing a wedding ring on your left hand. If you prefer your right hand for any reason or enjoy the symbolism of a right-hand ring, feel free to start your own tradition.